1. In level 1. Set a trigger where you want the jump to occur. 2. Set the trigger type to FINISH to the right of this type in a 2 (because this is the level you want to jump to). 3. Put the number 1 in the TIMER field. 4. 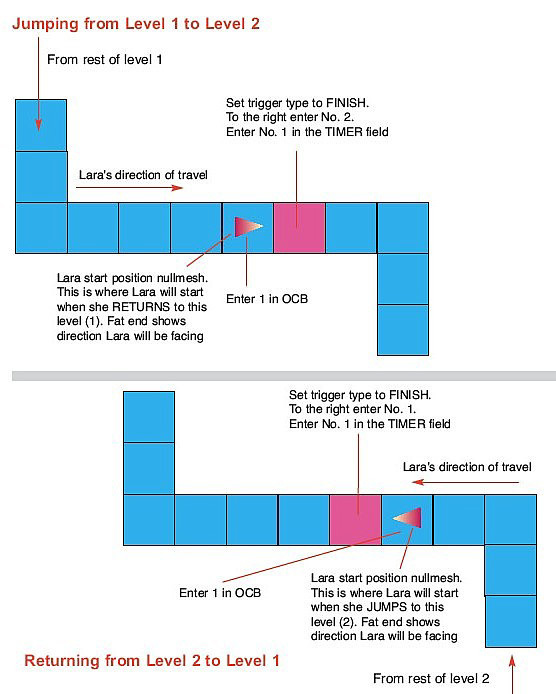 Place a Lara start position nullmesh in the square BEFORE the trigger. 5. Open the OCB for the Lara start position nullmesh. Put a 1 in the box, press enter and OK that. This is where Lara will appear when she jumps back from level 2. 6. In level 2. Again set a trigger to jump back. 7. Set the trigger type to FINISH and put a 1 in the box this time. 8. Put the number 1 in the TIMER. 9. Place a Lara start position nullmesh in the square before the trigger again. 10. Again open the OCB and type a 1. * You can have more than 1 'jump' in a level. If you do, the TIMER fields need to be changed to 2 or more in both levels. The OCB of the lara start position needs also to be changed to 2 or more in both levels. * The fat end of the nullmesh points to the direction Lara will be facing when she appears in the new level.